The Asset Dedication Strategy splits the portfolio into two parts: the “Income Portfolio” and the “Growth Portfolio.” The Income Portfolio is engineered to provide a defined stream of secure cash flows to fund any pattern of spending needs. The cash flows from coupon interest and redemptions of safe, investment grade bonds held to maturity. These bonds are purchased in the just the right quantities redeeming at the right time over a time horizon chosen by each client to integrate with the financial plan. For those not in retirement, the Income Portfolio finds advantageous spots along the yield curve. 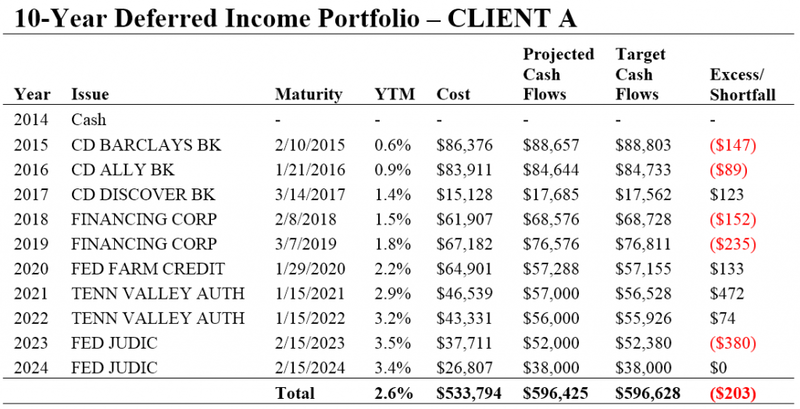 The chart above shows how we may have implemented a defined income portfolio in an attempt to match investments to a client’s future spending needs. The chart above is intended for illustrative purposes only. The securities used to create the projected cash flow columns were sourced on 10/19/2014 and are listed in the underlying securities tab. Because the fixed income market is constantly changing, the securities used to create this table should not be interpreted as representative of the current fixed income market. The projected cash flows do not represent a guarantee. Individual fixed income securities have the potential for default. Each security is assumed to be held to maturity. Individual securities reflect yield to maturity. Yield calculations for Inflation-Indexed securities include an assumption for future inflation. The table above shows securities that we may have purchased in an attempt to match cash flows to a client’s future spending needs. The table is being shown for illustrative purposes only. We sourced the securities listed in the table on 10/19/2014. Because the fixed income market is constantly changing, the securities used to create this table should not be interpreted as representative of the current fixed income market. The projected cash flows do not represent a guarantee. Individual fixed income securities have the potential for default. Each security is assumed to be held to maturity. Individual securities reflect yield to maturity. Yield calculations for Inflation-Indexed securities include an assumption for future inflation. We understand that accounts may have unique cash flow needs and may benefit by holding different fixed-maturity securities. Given this, we engineer the portfolio to match the specific cash flows that your client desires with the fixed-maturity securities that you define. We manage rising interest rates by purchasing fixed-maturity securities, and holding them until they mature. This gives us a secure advantage in long-term planning over bond funds that must sell their performing bonds when interest rates rise, and rely on chance to keep yields attractive. We believe it is essential to protect the principal for anyone who will rely on their fixed-income investments for spending needs. To deliver predictability, we hold investment-grade fixed maturity securities to maturity, so that your clients can effectively lock-in their principal investment while generating yield along the way. Watch Professor Huxley and Brent Burns meet with the American College to dig into the research behind the defined income portfolio. Enjoy!